BACKGROUND AND PURPOSE: The ADI is the imaging diagnostic clue to AAA subluxation of the cervical spine. Some MR imaging findings other than abnormal ADI relate to AAA subluxation. However, their relationship is not yet clarified. The present study elucidates the role of MR imaging by employing these previously overlooked findings. MATERIALS AND METHODS: This study enrolled 40 patients with AAA subluxation and 20 non-AAA subluxation patients as controls. All MR imaging was performed with supine neutral positioning. The morphology of the dens, bilateral facet joints, and surrounding ligaments, as well as the alignment of the anterior atlantoaxial joint, the spinolaminar line, and the intramedullary signal intensity, were assessed. This investigation statistically analyzed the difference among these groups. RESULTS: Thirty-eight percent (15 of 40) of patients with AAA subluxation showed nAAA. There was no significant difference between the groups of AAA with normal and abnormal ADI except that more peridental pannus was seen in the latter group. More dens erosion (P = .022), tilting of anterior atlantoaxial joint (P = .022), peridental effusion (P < .001), lateral facet arthropathy (P < .001), abnormal spinolaminar line (P = .001), and focal myelopathy (P = .001) were observed in nAAA patients compared with the controls. The combination of peridental effusion, lateral facet arthropathy, abnormal intramedullary signals, and abnormal spinolaminar line showed a sensitivity of 100% and a specificity of 90% in diagnosing AAA subluxation. CONCLUSIONS: MR imaging provides important biomechanical clues, other than ADI, that improve accuracy in diagnosing atlantoaxial instability. Anterior atlantoaxial subluxation is an uncommon cervical spine abnormality but is frequent in the patients with rheumatoid arthritis, with a reported prevalence between 12% and 33%.1–3 A diagnosis is made when the ADI, the distance between the posteroinferior aspect of the anterior arch of C1 and the most anterior aspect of the dens, is >3 mm.4 Early stage atlantoaxial instability usually causes compression of the occipital nerve roots, and the subsequent dislocation may cause compression of the spinal cord, resulting in myelopathy, long tract symptoms, and tetraparesis.5 Under current imaging practices, the diagnosis of AAA subluxation is based on neutral and dynamic positioning of the cervical spine radiography. Although dynamic radiography may decrease the false-negative diagnostic rate, the diagnostic sensitivity of AAA subluxation based on plain x-ray radiography is low,6 not to mention the fact that plain x-ray radiography lacks 3D information on soft tissues, joints, and the spinal cord. The diagnostic sensitivity of MR imaging for AAA subluxation appears to be even lower because supine positioning during scanning may further decrease the detection rate or downgrade the severity of subluxation due to gravity.6 Low prevalence in the normal population and the dissatisfactory diagnostic sensitivity for AAA subluxation pose a diagnostic challenge to both the clinicians and the radiologists, particularly when patients are referred with nonspecific symptoms/signs and no additional dynamic positioning radiography. Anatomically, the anterior atlantoaxial joint, bilateral lateral facet joints, and the ligamentous structures (ligamentum flavum and ligamentum interspinosum) of the posterior column form a complete atlas rim at the atlantoaxial level with these 4 anchoring points. We assume that, potentially, the instability of any of these anchoring points causes AAA subluxation. Plain radiographs provide little information about the anchoring points. MR imaging is obviously superior to plain radiography for providing 3D information and excellent soft tissue contrast. This may help improve accuracy in diagnosing AAA subluxation. To our knowledge, no MR imaging report is yet available in the literature by using this approach to evaluate AAA subluxation. Therefore, the present study systematically investigates imaging findings of supine neutral positioning cervical spine MR imaging and focuses on these anchoring points in both normal and abnormal ADI cases to improve accuracy in diagnosing AAA subluxation. Consecutive patients with AAA subluxation diagnosed at our institute by MR imaging and plain x-ray radiography (including dynamic study) from January 2004 to December 2007 were recruited. The interval between MR imaging and radiography was <3 months. Patients with congenital craniovertebral junction abnormalities, C1–2 fractures, and incomplete ossification were excluded. On supine positioning MR imaging, ADI was defined as the distance between the posteroinferior aspect of the anterior arch of C1 and the most anterior aspect of the dens.7 The measurement line was parallel to the endplate of C2. With an ADI of 3 mm as the cutoff normal value, patients were grouped into nAAA subluxation (ADI ≤ 3 mm) and aAAA subluxation (ADI > 3 mm). For study control, 20 consecutive patients (15 men and 5 women; age range, 23–79 years; mean, 58.2 years) without AAA subluxation were enrolled and underwent the same imaging studies during the same period. The Institutional Review Board approved the study. All patients were examined by using 1.5T MR scanners with neutral positioning and spine coil and the following imaging parameters: T1-weighted sagittal spin-echo included a TR/TE of 400/15 ms, a section thickness/gap of 3.0/0.3 mm, a FOV of 260 × 220 mm, and a matrix size of 288 × 256. T2-weighted sagittal turbo spin-echo imaging included a TR/TE of 2000/110 ms, a section thickness/gap of 3.0/0.3 mm, a FOV of 260 × 220 mm, and a matrix size of 288 × 256. 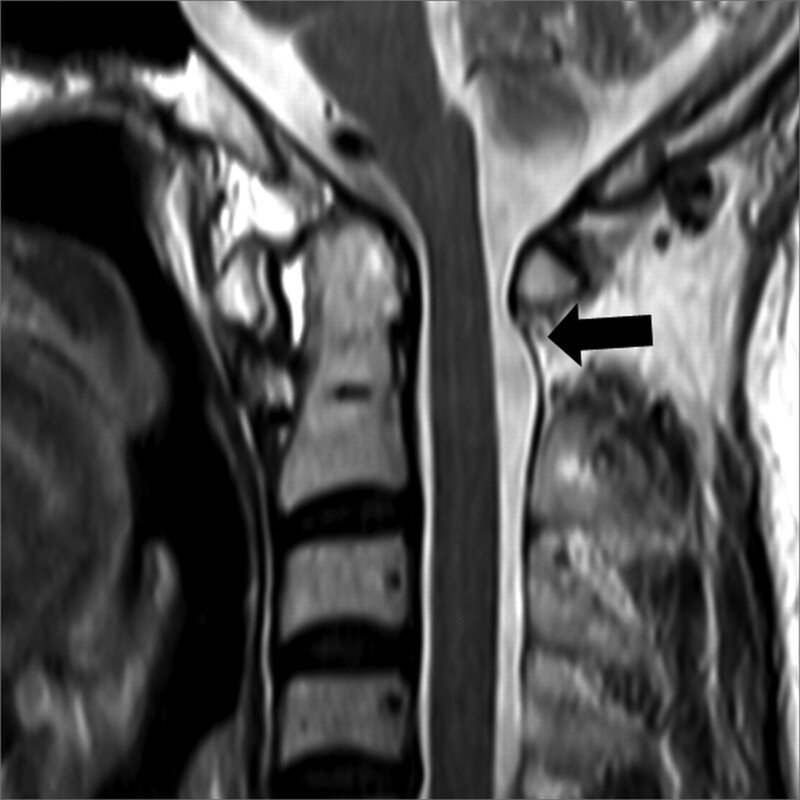 Transverse scanning of C1–2 levels was not routinely included in the clinical MR protocol of cervical spine, and imaging review was not included in the retrospective study. Special attention was paid to the integrity of dens, facet joints, surrounding ligaments, the alignment of anterior atlantoaxial joint, the spinolaminar line, and the intramedullary signal intensity of cervical spinal cord (Table 1). Typical examples were illustrated as below: tilting of anterior atlantoaxial joint (defined when the planes of posterior cortical margin of atlas anterior arch and anterior border of odontoid peg were not parallel, Fig 1); abnormal spinolaminar line (defined as loss of smooth curve of the spinolaminar line, Fig 1); focal myelopathy (defined as abnormal focal T2 high signal intensity of the spinal cord at the craniovertebral junction, Fig 2); peridental effusion (Fig 2); pannus (Fig 3); abnormality of adjacent ligaments (defined as thickening or nonvisualization, Figs 3 and 4); and changes in bilateral lateral facet joints (Fig 5). 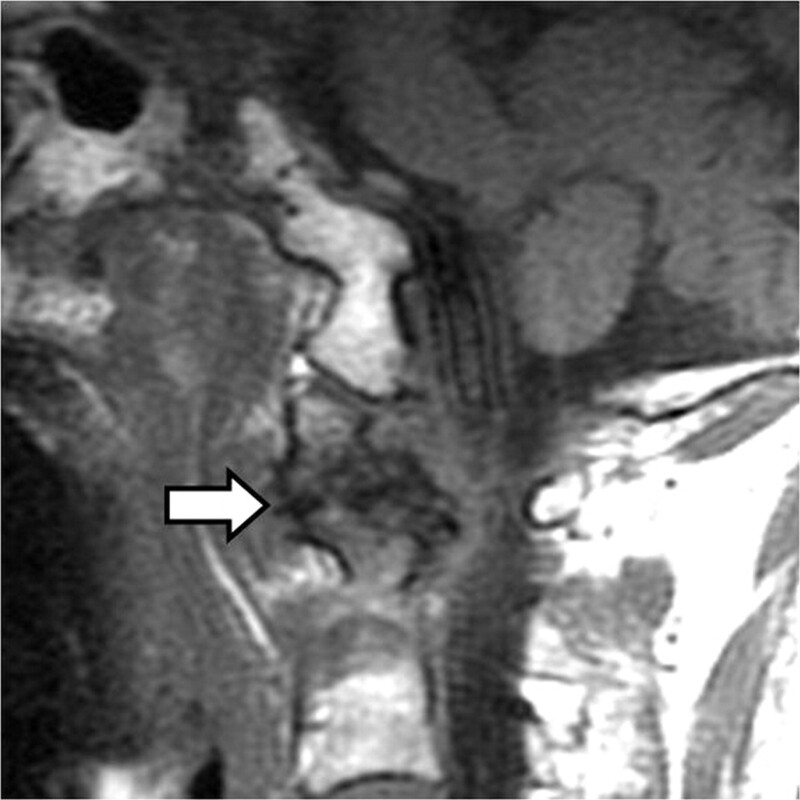 Midsagittal T2-weighted MR image in a 64-year-old woman with rheumatoid arthritis. The image shows that the posterior cortex of the anterior tubercle of C1 and the anterior cortex of the odontoid process are not parallel. Also note the abnormal spinolaminar line (arrow). Midsagittal T2-weighted MR image in a 72-year-old man with spondylosis. The image depicts focal high signal intensity at the cervical spinal cord (arrowhead). Note minimal fluid accumulation in the supradental region. 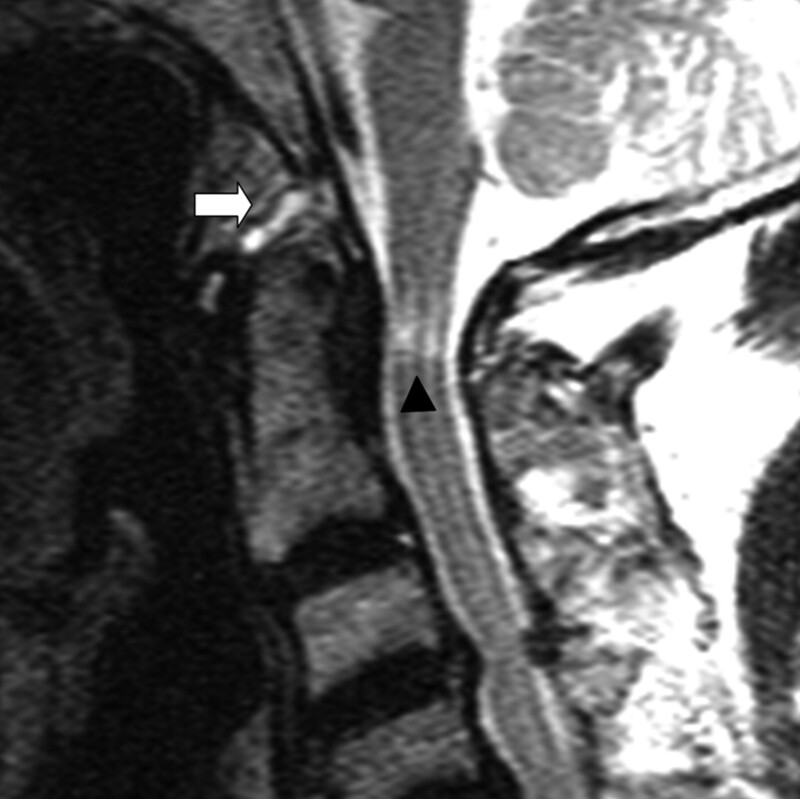 Midsagittal T2-weighted MR image in a 69-year-old woman with rheumatoid arthritis. The image shows peridental fluid, pannus proliferation (arrow), and nonvisualization of the apical ligament. The atlantodental interval measured 7 mm on flexion radiograph (not shown). Normal apical ligament (arrow) and normal anterior atlantoaxial ligament (arrowhead) in the diagram (A) and the midsagittal T2-weighted MR image (B) in a 45-year-old woman with rheumatoid arthritis. Note the widened atlantodental interval (4 mm). Paramedian sagittal T1-weighted MR image in a 65-year-old woman with spondylosis. The image shows erosion of the lateral facet joint and bone marrow edema (white arrow). Peridental effusion (or pannus) was classified as PD, retrodental, or supradental, based on its anatomic location. Lateral facet joint changes included bone erosion, joint effusion, and joint space widening (>2 mm). In patients with nAAA subluxation, the sensitivity and specificity of each individual MR imaging sign were calculated. Chi-square and Fisher exact tests were used to compare nAAA with aAAA subluxation, as well as nAAA subluxation with the control group, having P value set at <0.05. A combination of criteria that optimized sensitivity and specificity for the diagnosis of nAAA subluxation were also developed retrospectively. The study consisted of consecutive 43 patients with AAA subluxation who received MR imaging within a 3-month timeframe between 2004 and 2007. Three of them with the following conditions were excluded: one 75-year-old man with C2 fracture, one 9-year-old boy with incomplete ossification of the odontoid process, and one 42-year-man with different MR protocols. Consequently, the study group enrolled 40 patients (16 men, 24 women; age, 26–90 years; mean, 64.7 ± 12.9 years). The diagnoses of these patients consisted of rheumatoid arthritis (n = 11, 28%), ankylosing spondylitis (n = 1), trauma (n = 7), degenerative change (n = 19), and idiopathic or inconclusive (n = 2). Twenty-five of 40 patients (62%) (11 men, 14 women; age, 26–90 years; mean, 64.7 years) were diagnosed with aAAA subluxation with the ADI ranging from 3.1 to 9.5 mm (mean, 5.6 mm). The other 15 (5 men and 10 women) out of 40 patients (38%) were diagnosed with nAAA subluxation with a diagnoses of rheumatoid arthritis in 6, ankylosing spondylitis in 1, trauma in 2, and degenerative or idiopathic changes in 6. For the control group, the diagnoses included trauma (n = 2), degenerative changes (n = 16), and inconclusive (n = 2). Tables 1 and 2 summarize all MR imaging findings. Peridental pannus was found in 88% of aAAA subluxation patients, abnormal spinolaminar line in 92%, and anterior atlantoaxial ligament change in 48% of the patients. These frequencies were greater than those for these conditions in the nAAA subluxation group (Table 1). Dens erosion, tilting of the atlantoaxial joint, and peridental effusion were observed, respectively, in 47%, 47%, and 40% of nAAA subluxation patients, which were significantly higher than in the control group, which had 0%, 10%, and 0%, respectively. An abnormal spinolaminar line was identified in 47% and focal myelopathy in 33% of the nAAA subluxation patients, but neither was found in the control group. No significant difference was found for peridental pannus formation or for signal intensity abnormalities within the anterior atlantoaxial ligament and apical ligament. Excessive movement between atlas and axis characterizes anterior atlantoaxial instability. At present, dynamic plain radiographs are the criterion standard in diagnosing AAA subluxation. The atlas slips abnormally forward during flexion because of laxity or rupture of the transverse and alar ligaments. The atlas slips backward when the cervical spine is in the neutral or extension positions. A few studies have reported MR imaging findings of AAA subluxation,8,9 but none has focused on the diagnostic implications of abnormalities in the associated structures or suggested a method to improve the false-negative diagnostic rate in nAAA subluxation patients. To our knowledge, this study is the first attempt to do so. Involvement of the atlantoaxial joint, including the peridental pannus, peridental effusion, and dens erosion, are frequently observed in AAA subluxation.10 Inflammation of the synovial lining of the bursae and articular capsule leads to pannus proliferation, followed by destruction of the cartilage and the subchondral bones and, finally, instability. In our series, there was no significant difference regarding pannus proliferation between the nAAA subluxation group and the control group. A possible explanation for this finding is that pannus formation usually reflects a reactive response to chronic inflammatory or degenerative disease. Pannus without associated bony erosion or ligamentous tear at the early disease stage does not lead to AAA subluxation. The subsequent bony erosion and increased synovial effusion represent arthritis that is more advanced. Additionally, instability of the anterior atlantoaxial joint results in negative pressure within the joint space that pulls in more interstitial fluid. Peridental effusion and dens erosion did achieve statistical significance in our study. Based on the biomechanics,11 there is no limitation to sagittal rotation of the atlantoaxial joint. That is, the atlas is free to rotate during flexion/extension until the posterior arch hits the occiput or the neural arch of C2. This means tilting of the atlantoaxial joint can be a normal finding during flexion and extension movements. However, tilting of the anterior atlantoaxial joint in the neutral position was seen in nearly half of the nAAA subluxation patients but was seen in none of the control group. One possible explanation is that instability and weakness of the periarticular structures holds the atlas loose in the neutral position. Whether this finding constitutes an early sign of instability requires further investigation. To our knowledge, no published report discusses this easily overlooked finding. The transverse ligament is recognized as the most important structure that is responsible for atlantoaxial instability.12 Because transverse and alar ligaments are difficult to visualize on sagittal images, this study chose peridental effusion and pannus as indirect signs of abnormalities within these structures, rather than direct inspection and measurement. Other ligamentous supporting structures, including the anterior atlantoaxial ligament and the apical ligament, are relatively ignored and are thought to be clinically insignificant.13 Apical ligament abnormalities (thickening or absence) in both groups were not rare.14 This observation is in agreement with previous reports,12,14 and it reflects the inconsistency of this vestigial structure. The anterior atlantoaxial ligament extends from the anterior midportion of the dens to the inferior aspect of the anterior arch of C1, and prevents hyperextension of the upper cervical spine. The role of the ligament in stabilizing the atlantoaxial joint is thought to be weaker than the transverse and alar ligaments and it provides a secondary support.15 Once the primary ligaments (transverse and alar ligaments) are disrupted, the secondary ligaments are susceptible to injury and stretch with relative ease. This probably explains why the abnormalities of the anterior atlantoaxial ligament were seldom observed in the nAAA subluxation group and the control group but were significantly more frequently seen in the aAAA subluxation group (48%). Facet displacement of the lateral atlantoaxial joint has been proposed as a useful sign for diagnosing AAA subluxation by using conventional or 3D CT.18 In our results, a mild trend of facet displacement was observed in the nAAA subluxation group (data not shown) with a modest statistical difference (P = .14). Nevertheless, MR imaging provides more information about the facet joints beyond displacement. Subtle changes of lateral facet joints, such as bony erosion, presence of joint effusion, or joint space widening, were all more frequently observed in the nAAA subluxation group and were useful diagnostic clues in early detection of instability before facet displacement. In patients with nAAA subluxation, cervical compressive myelopathy is caused by 2 mechanisms. One mechanism is intraspinal encroachment of the peridental pannus, which is usually evident on MR images by its abnormal soft tissue signal intensity. The other mechanism is narrowing of the bony spinal canal by a subluxed atlas. Sometimes, this may not be apparent in the neutral position and is only evident during flexion.8 This explains why only 1 patient among the 5 patients with focal myelopathy in the nAAA subluxation group demonstrated spinal canal narrowing. Therefore, suspicion of atlantoaxial joint instability should always be kept in mind once focal high cervical myelopathy is depicted as the only significant finding. This study retrospectively applied optimal diagnostic criteria by using peridental effusion, lateral facet arthropathy, focal myelopathy, and an abnormal spinolaminar line. If the diagnosis of nAAA subluxation were made on the basis of either of these criteria, an optimal calculated sensitivity of 100% and a specificity of 90% could theoretically be achieved in this patient population. This combination of diagnostic criteria also supports the hypothesis that indirect signs of instability must occur in at least 1 of the anchoring points before AAA subluxation develops. Several limitations were present in this study. First, the study population was small, and approximately half of the study group had inflammatory arthritis. The known trend of rheumatoid arthritis to involve the synovial-lining joint and cause pannus formation may lead to a characteristic appearance different from those patients with spondylosis.19 However, in our results, no significant difference was found in the incidence of pannus between the nAAA subluxation and control groups. 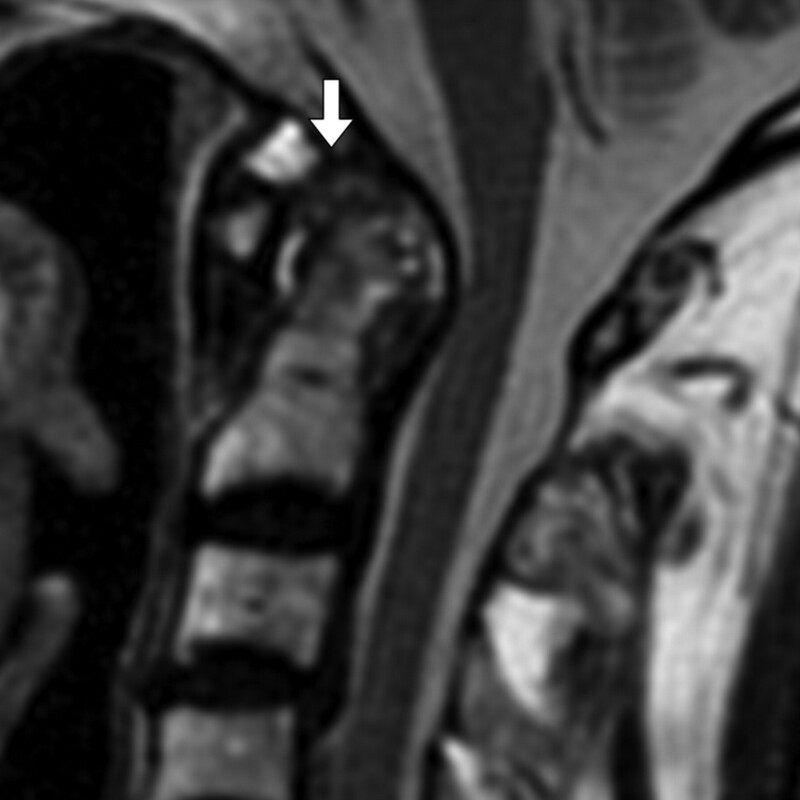 Second, additional tailored sequences, such as short τ inversion recovery or fat-saturated T2-weighted imaging, can improve detection of signal intensity in the atlantoaxial joint, craniocervical ligaments, and prevertebral soft tissues,20 and contrast-enhanced study can improve the delineation of pannus or synovitis and differentiate joint effusion and various forms of pannus and depict ancillary findings.21 On top of routine pulse sequences, we added these sequences for rheumatoid arthritis patients or those with other known inflammatory disorders. Because the study group included diverse clinical diagnoses, the short τ inversion recovery, fat-saturated FSE-T2-weighted, and postcontrast scanning were not used for all patients. Moreover, in some cases the diagnosis of AAA subluxation was not even suspected by the clinicians when they referred patients for MR examinations. Third, although AAA subluxation is the most frequent abnormality of the cervical spine in patients with rheumatoid arthritis, several other abnormalities may also occur in the same patient, including vertical atlantoaxial dislocation (atlantoaxial impaction) and rotatory atlantoaxial subluxation. The contribution of these coexisting instability problems to abnormal MR imaging findings is indisputable and should always be kept in mind. MR imaging is a valuable tool for diagnosing atlantoaxial instability and has a sensitivity of 100% and a specificity of 90% based on our proposed diagnostic criteria (peridental effusion, lateral facet arthropathy, focal myelopathy, and an abnormal spinolaminar line). Additionally, MR imaging may provide earlier warning signs of instability that predate the clinical symptoms. Further investigations to confirm both these findings and the diagnostic efficacy of our criteria would be invaluable. S.-C. Hung and H.-M. Wu shared the first authorship. Paper previously presented in part at: American Society of Neuroradiology 46th Annual Meeting, New Orleans, Louisiana, May 31–June 5, 2008. This work has been supported in part by grants from the National Science Council (NSC-97-2785-B-075-001PAE, NSC-98-2785-B-075-001PAE) and Taipei Veterans General Hospital (V97C1-025, V98C1-109).